The Regional School Unit 9 school board. 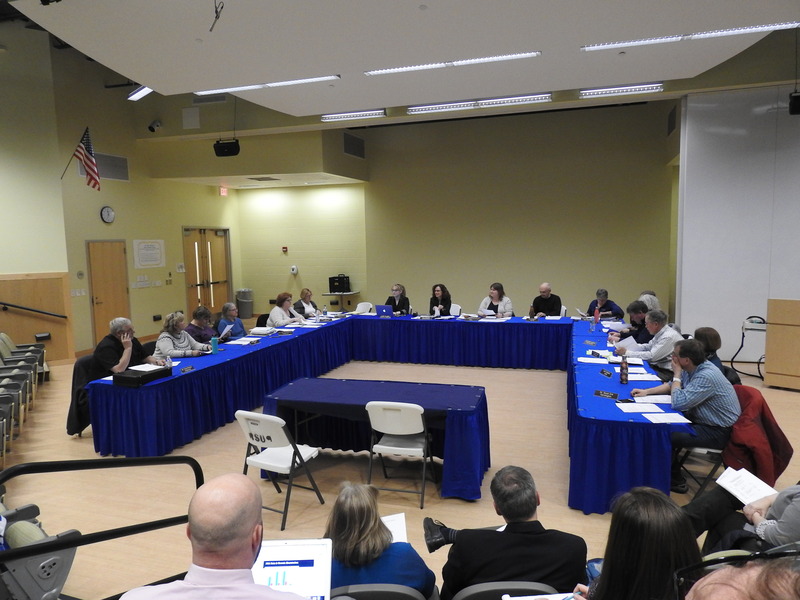 FARMINGTON - The Regional School Unit 9 school board received a report on the Mt. Blue Middle School from the building's top administrators Tuesday, reviewing enrollment numbers, new school initiatives and Maine Educational Assessment test scores. Principal James Black and Assistant Principal/Athletic Director Katie Duchesne gave the report, part of a series on the state of Mt. Blue schools. One of the initial parts of the discussion focused on the recent increase in enrollment at the middle school, something that goes against most statewide trends. MBMS is the only grade 6 through 8 school in RSU 9. There are currently 544 students enrolled at MBMS, Black reported Tuesday, marking a 9.6 percent increase over the past four years. That larger-than-planned population has created different challenges; parking and vehicle access can be challenging, Duchesne said, particularly when parents come to pick up students. The school's gym was built back when the school housed 400 students. Black said that the school worked to use all available space, but the building wasn't designed for so many students. Director Jeff Harris of New Sharon said that the Operations Committee was also discussing the issue. The last significant renovation for the MBMS was in 2000. Options such as school construction or another renovation could take up to 10 years to organize, as there are many requests across the state for Department of Education funding. Shorter term solutions could include the installation of portable classrooms, although Black noted that the school needed to leave space for parking. There was a four-classroom portable previously at the MBMS site, but it was eventually moved to the high school to serve as the Franklin County Adult Education offices. Despite the increase in enrollment, administrators reported a decrease in absences, down to 548 from last year's 610, comparing both school year's first semesters. That decrease, despite an increase of 27 pupils at MBMS, was one of Black's focus following a spike in absenteeism last year. In 2017-18, students missed a combined 1,300 days of school, not including sick days, suspensions and parent excused absences. Administrators implemented the Strive for 5 campaign, challenging parents and their students to accrue five absences or less throughout the year. The campaign included setting up competitions between the school's six communities and announcing the results at the monthly school assembly. Other initiatives designed to recognize student achievement include the implementation of the students of the month assemblies, the "Golden Ticket" recognition program and brainstorming ways to make the school as welcoming as possible for students. Staff gather in the halls at the beginning of school days to personally welcome students, for example. "We don't always know where these kiddos are coming from," Black said. The district now has three years of data from the state regarding student MEA scores and, for the first time, data on specific areas that students showed strengths and weaknesses. At MBMS, math scores for grade 6 and 7 decreased, while grade 8 scores increased. Duchesne, a former math teacher, said that the specific domain that the middle school needed to work on was Mathematical Practices. English Language Art scores were inconsistent across the school, with some grades showing improvement and others not. Science scores remain a strength of MBMS and the district as a whole, Duchesne said, both within the Regular Instruction and Special Education cohorts. Duchesne cautioned that additional data points would be required before the scores could begin revealing trends. "Unless we get longer trends," she said, "in my opinion, it's difficult to know why." Easily the most obvious trend, however, is that economically disadvantaged students trail their peers by generally wide margins: up to 20 or 30 percent fewer students meeting or exceeding MEA standards. This is generally true throughout the state, but it is still a point that school board directors have repeatedly referenced throughout the school reports. Black said that he believed it was important to get kids and their parents involved in the school - sometimes reaching parents that themselves may have had bad experiences at school - and ways to interest students in their education. MBMS has a number of extracurricular activities, ranging from band and chorus to a number of athletic programs to clubs like Robotics, Drama and the Civil Rights Team. Noting that "bored kids make poor choices," Black said he felt that participation in extracurricular activities could be essential to a student's continued academic success. "School, for a lot of kiddos, is going to be their way up and out of that situation," Black said. Directors asked for data regarding extracurricular activity participation and Black and Duchesne said they would put it together prior to the next meeting. Just curious before we go pursue changing the middle because of to many students. Have we reviewed the number of students in younger grades. This totally makes sense because these grades had increased numbers and that is why 6th grade was moved to the middle school a few years ago to accommodate the increase. Now we are seeing these grades in the middle school. So I would be looking at the population of the younger grades to assess future numbers and space needs. I would also say the grade scores are a reflection of the children’s curriculum and how they are being taught. The distraction of all the behavioral children that take away time needs to be addressed. It does the children no good to have these kids in the class room distracting the teachers from teaching. Until this is addressed the kids that could exceed will be dragged down. It is time to hold the parents accountable and send them home. We need to stop taking away their responsibilities as parents. Or these kids need to go to separate classrooms until they are ready for regular classrooms. It is not fair for kids that need a little help from the teacher and cannot get it because they are to distracted with troubled students. The focus should be on the children that are ready to learn and our test scores will increase. Well said Townie, I agree with you. Job well done Mr Black on all your successes at MBMS. I heard so many positive things happening at your school and feel the kids are in amazing hands there. Thank you for all you are doing. So you are saying that certain kids deserve special treatment because they have no "issues"? Let me ask you this, if you had a child that was born with a disability, that was minor enough that they can learn in general classroom settings but would occasionally become frustrated or perhaps embarrassed that they were not "getting" something the other kids were and have an "outburst", are you saying your child should be put in a separate classroom and be isolated from the rest of the kids because of this? How about taking into consideration that most of the kids at this school are also going through different stages of puberty and hormones are an issue as well. Most kids that age are not ready or do not know how to deal with these feelings. Tell me when you were in middle school, kids didn't have outbursts then? This is not an issue, they are kids, people need to stop segregating these kids and then wonder why bulling is such an issue! Bullying starts because adults show the kids its ok to treat people like aliens if they are different in any way shape or form!!! Maybe if we are so worried about test scores we should be segregating the kids with the higher test scores and let them learn with no distractions and put them in separate classrooms ? Sounds dumb right??? They are kids, deal with that, kids have outbursts, they act out , it happens! (I am on the School Board, but I'm writing this as a citizen's opinion, not reflecting any Board position). I'm not sure Townie knows what is going on in the schools. First, if students are special ed, they will join classes but usually with an Ed Tech who can assist, and who can remove the child if the child becomes disruptive. From what I've observed, children who are too disruptive will get a different kind of care. Also, there have been problems with disruptive students in K-5 who are not, or have not yet, been labeled special education. The PALS program is being created this year to have a place for them to either improve behavior with special guidance, or gain evidence needed if the child deserves special education. It is not the case that a lot of special education children are simply unleashed into classrooms with nothing been done to assure they get the most out of the experience, and that disruptions are minor. I think a lot of people underestimate the training, expertise and care our special education teachers and ed techs provide. I also believe that economic disadvantage plays a big role here - we need to support programs like the Children's Task Force and others who try to get children help early. The schools can only do so much, community organizations and support for the needy are really important. @just sayin the kids are not segregated at school. However when the state goes through the testing scores they are segregated into two categories. 1 economically disadvantaged and 2 non economically disadvantaged. Regarding truancy---personal experience with a neighbor: parent got call from the school after about 30+ days of her son being absent from school. Two problems I witnessed as a objective outsider 1.) the kid was absent from school 30+ consecutive days before the school followed up on where he was. 2.) the parent seemed to be *completely oblivious* to her responsibility for her child getting to school (or mediating/dealing with his resistance to going to school) and communicating with school about problems getting him to go to school. This particular parent seemed, utterly, unaware you can simply say : get in car, we are going to school NOW. Obviously, intervention was needed...and it was not happening. To my knowledge every day a student is absent the school calls home attempting to get verification of the student's absence. If the parent wasn't informing the school about why exactly the student wasn't coming in that would explain why it took so long for intervention. It is not the school's job to parent. It is the school's job to educate the student once they get to school. Too much is being asked of our school staff which is one of the things that makes it difficult for "teachers to just teach".